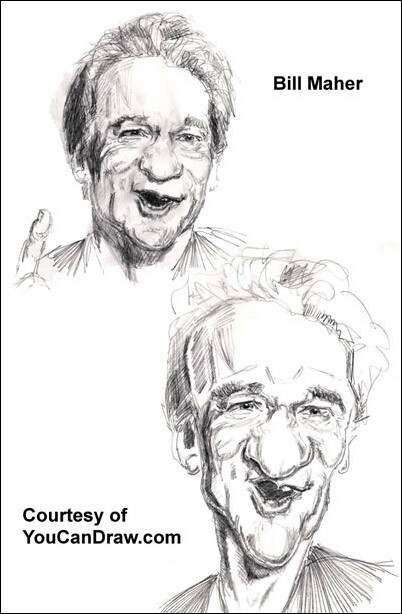 subtle variations in comedian Bill Maher's face. OK, you asked for it, you got it -- there's 22,000 requests a month for "funny faces" out there on the Internet. 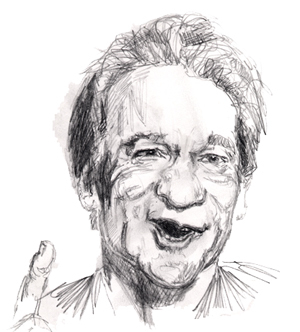 Here's our contribution: Funny Face #1 Bill Maher. What follows is posted with permission by our sponsoring site YouCanDraw.com. for an interesting contrast. Mr. Maher has a "light bulb" shaped head. His "foofed up"hair accentuates that look even more. The nose as - just mentioned - is broadest at it's base (remember the root of the nose is up there at the level of the eyes, the base down there just above the upper lip ). More than being just broad at the base, Mr. M's nose fans out like a yard rake (I don't mean that disresepctfully at all - just a visual analogy). is evident when he talks too. This is a neat find in a subject: asymmetry that is. "Cupid's Bow" - that's the very center lobe of the lip. on the thin side and are light in color. a distinct shadow shape attached to it. Also notice that giving a "pencil neck"
looks so much more exaggerated it's not funny. In this view you can't tell at all! Interesting piece of research, eh? kept with the light bulb shape direction we saw in the original. contrasting all the different sizes and dimensions of each section. the sternocleidomastoid muscles (the two long muscles that form a "V"
Like these lessons so far? 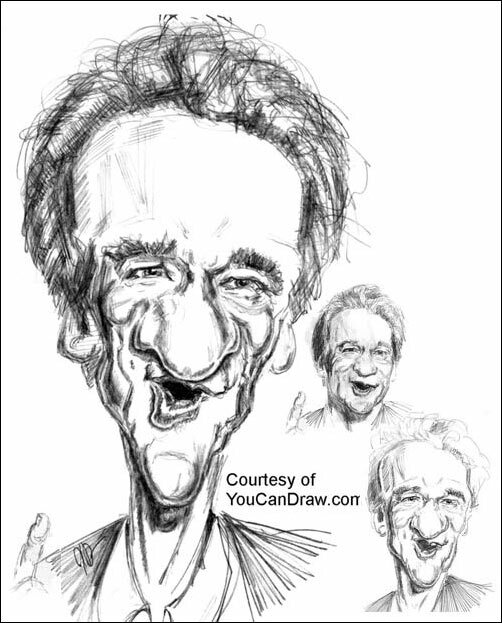 Here's an affordable, 1000+ page electronic book that covers all the basic's of drawing and how to draw faces and caricatures in much more depth - and with all sorts of exercises. You can find it at www.YouCanDraw.com.